Pie is always a good choice. Whether it’s super simple or elevated to new heights, a wedge never fails to put a smile on our faces. Here are 15 stellar slices to savor on National Pie Day and beyond. Not near any of these spots? Find a place to celebrate the day – or any day – on OpenTable. Can you handle this pie? 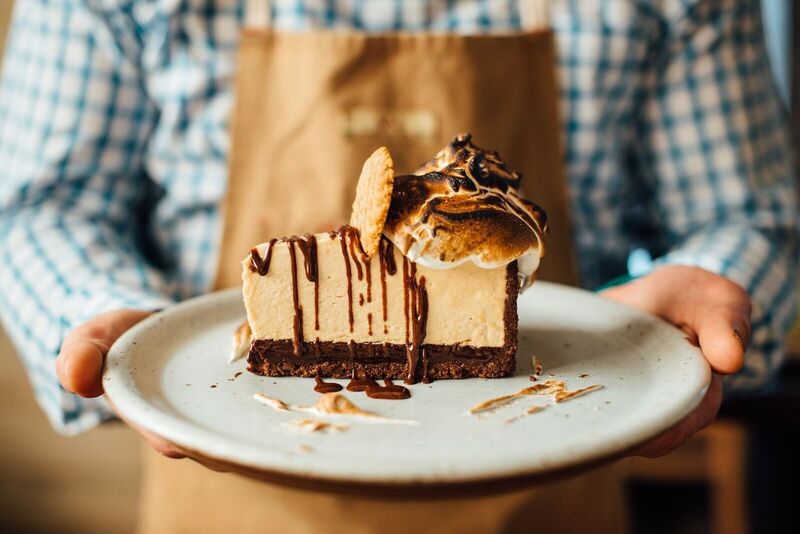 With a chocolate truffle bottom and a peanut butter body, it boasts a crest of torched banana meringue. As if that wasn’t enough, there’s a bonus peanut butter cookie perched on top. Make a reservation at Acre. America Eats Tavern, Washington, D.C.
Here’s an icebox version of a picnic table favorite. 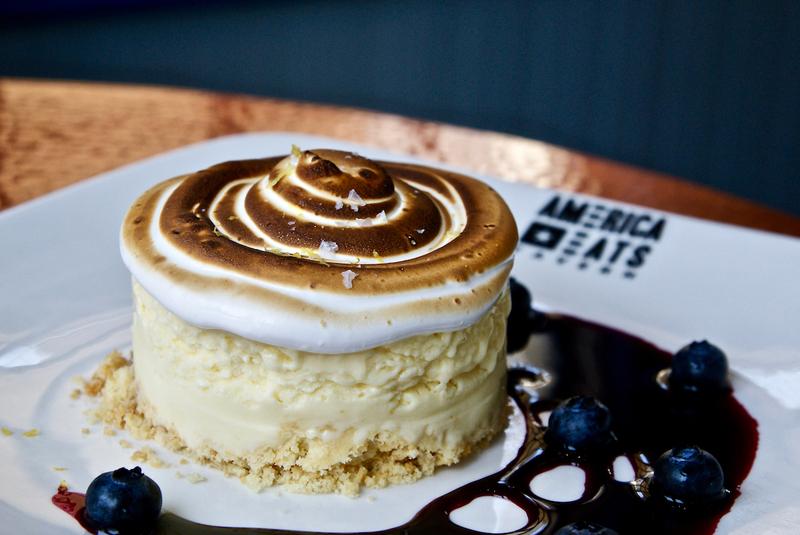 Shortbread cookie crust cradles layers of frozen lemon cream and toasted meringue. Saucy blueberries add another touch of tang. Make a reservation at America Eats Tavern. Here’s a baller way to end your meal. 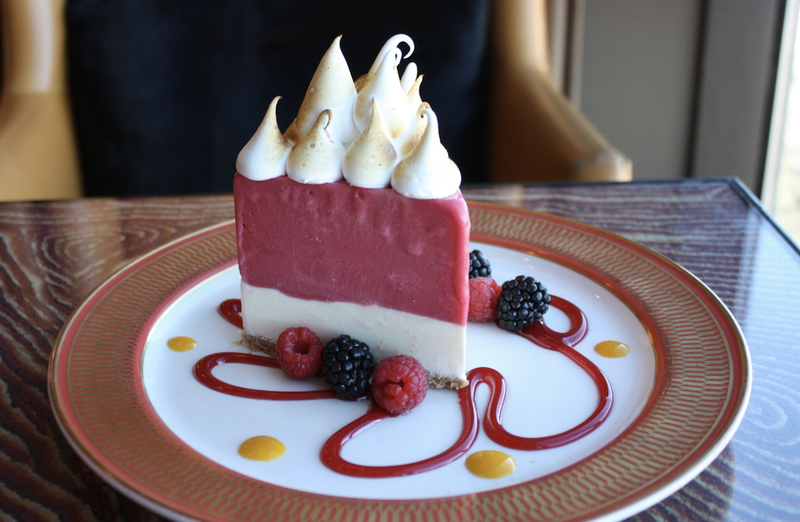 The Millionaire Pie features layers of raspberry sorbet and vanilla ice cream in a graham cracker crust. Spires of toasted meringue are a fetching finishing touch. Make a reservation at SER Steak + Spirits. 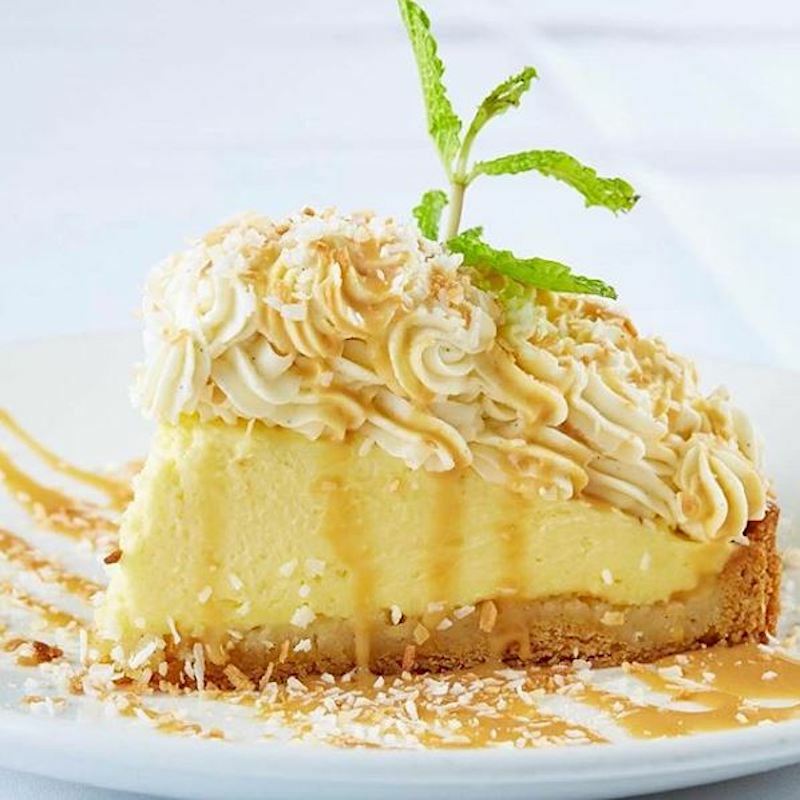 Coconut cream pie always reminds us of vacationing by the seaside. A monster slice of it comes with whipped cream, crunchy toasted coconut bits, and a zigzag of caramel. All that’s missing is the beach. Make a reservation at Dakota’s Steakhouse. There’s something about buttermilk’s tang that keeps us coming back. It’s the basis for this fetching pie, which comes with berry compote and Vietnamese coffee ice cream. #DivinelyDelicious. Make a reservation at Copper Vine. Calling all chocoholics! Here’s a great way to indulge. 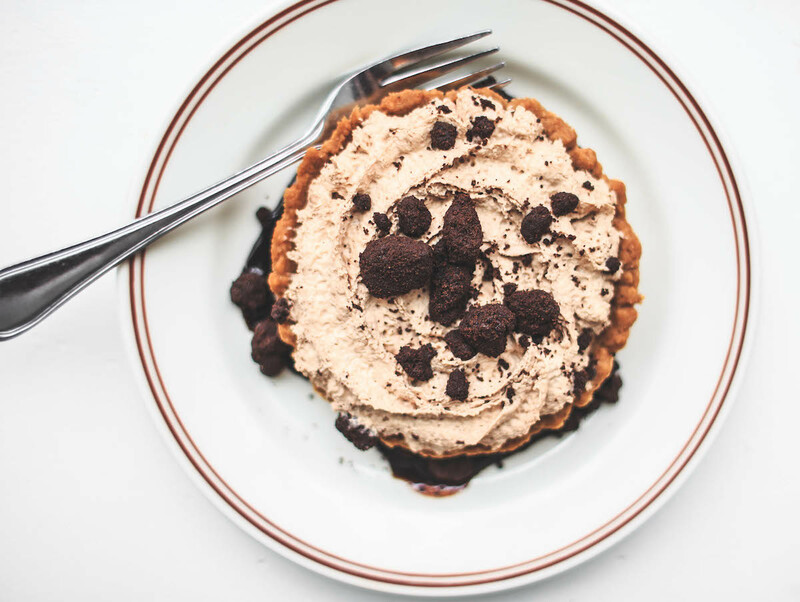 This utterly chocolaty French silk pie features chocolate crumble crust and chocolate whipped cream. Make a reservation at Little Goat Diner. 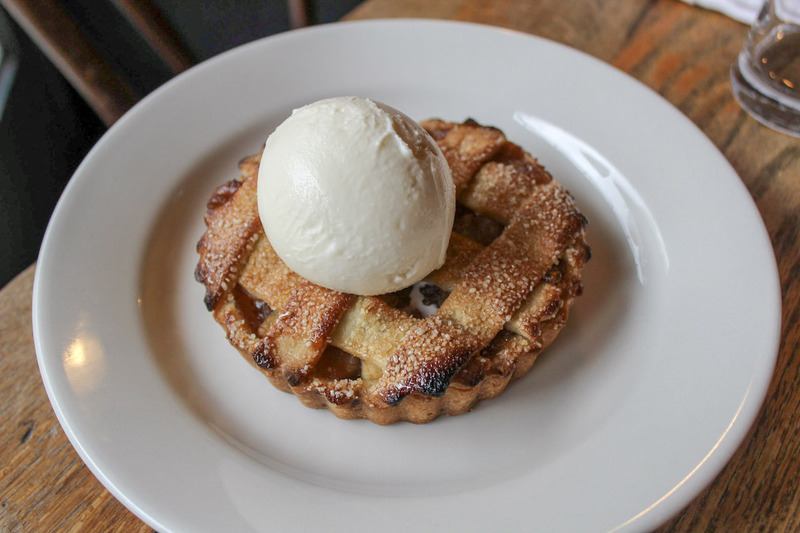 The Smith – U Street, Washington, D.C.
Caramelized Honeycrisp apples are the foundation of this petite pie. 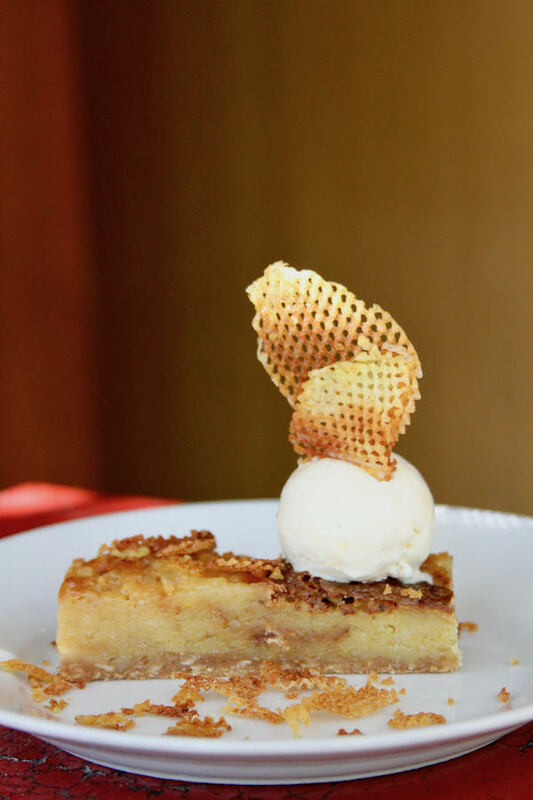 Presented in a toasted almond cookie crust, it’s coronated with a scoop of bourbon ice cream. If you enjoy it with a glass of bourbon, you won’t be disappointed. Make a reservation at The Smith – U Street. 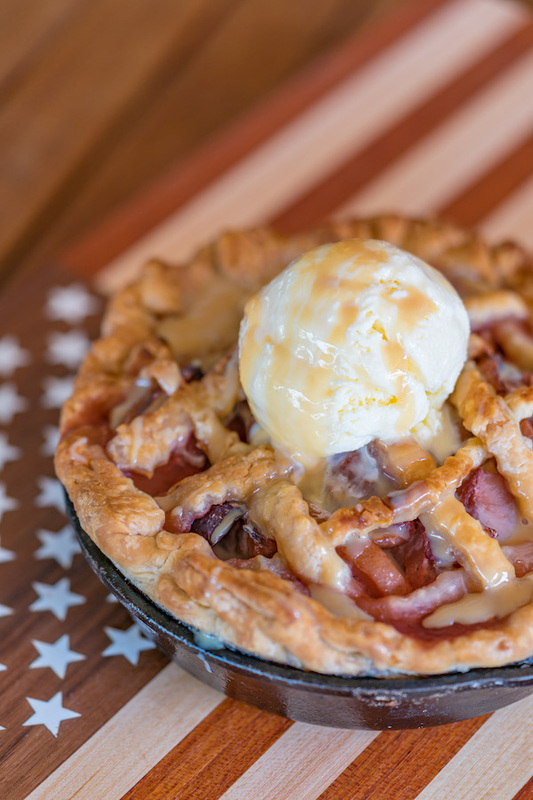 It doesn’t get more American than apple pie. This patriotic pastry features a butter-rich crust and well-spiced apple filling. A scoop of vanilla ice cream completes the continental classic. Make a reservation at American Social. Some say pea-can, some say pea-kahn. Either way, this deliciously decadent pie is a stone cold classic. A triangle of it arrives with whipped cream and vanilla ice cream (and a glass of wine, if you’re in the mood). Make a reservation at Wolfgang’s Steakhouse. Here’s a new one for us: potato chip pie. 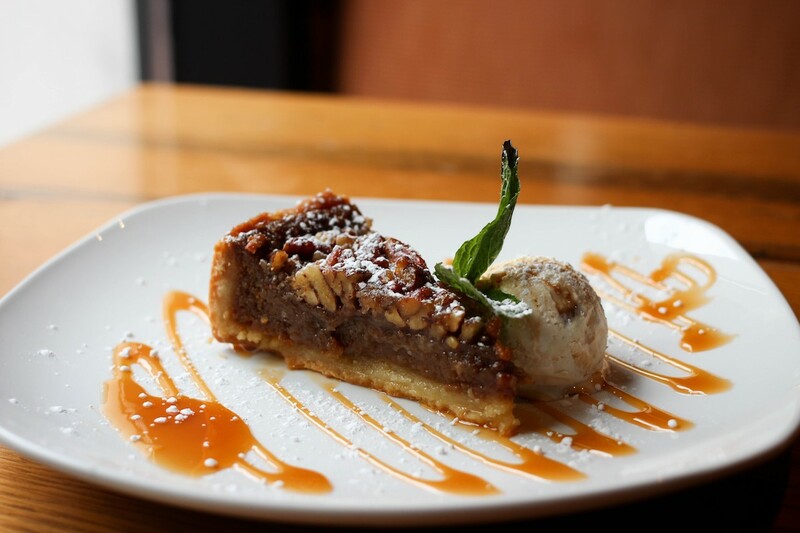 The uniquely savory-salty-sweet confection boasts an oatmeal cookie crust, salted caramel ice cream, and house-made potato chips. Betcha can’t eat just one (bite). Make a reservation at The Kitchen. 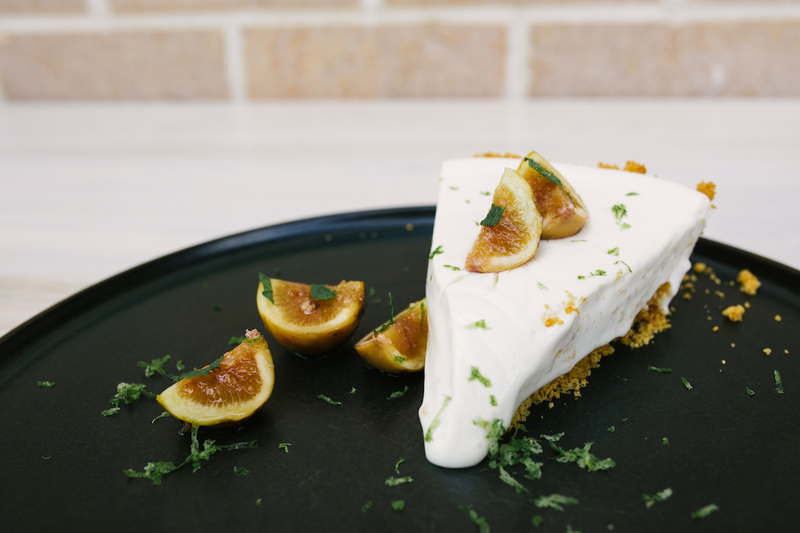 Pastry chef co-owner Elise Russ uses a recipe from her grandmother to make her key lime pie. The tart ‘n’ tangy treat comes with seasonal fruit, such as candied kumquats. A slice goes does even better with a glass of cold milk or strong black coffee. Make a reservation at Clementine. You’re gonna go nuts for this pie! 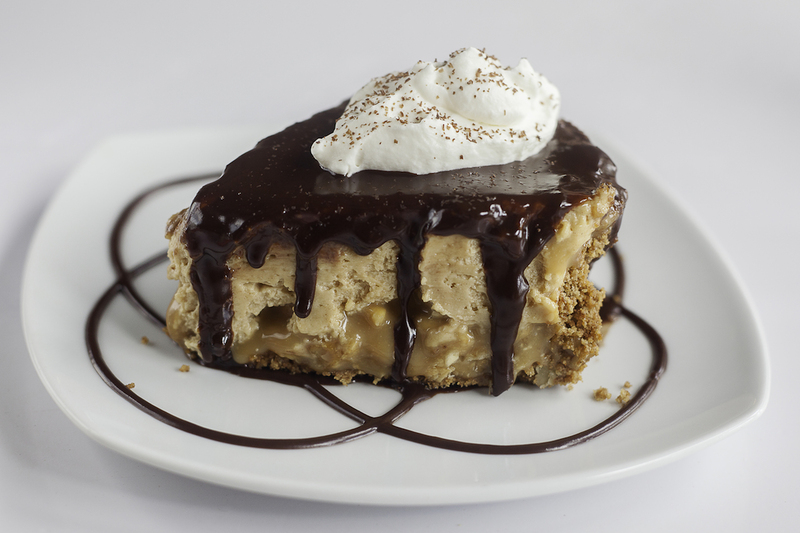 Graham cracker crust cradles a layer of sinfully sticky caramel and peanuts topped off by fluffy peanut butter mousse. It’s topped with melted chocolate and a generous dollop of whipped cream. Make a reservation at Farmers Fishers Bakers. Remember the PB&J sammies your mom used to make? 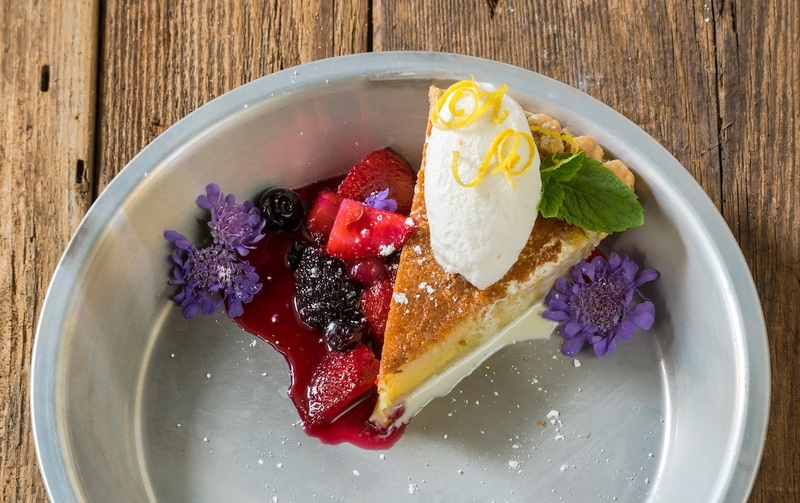 This dessert evokes them – minus the Wonder Bread. 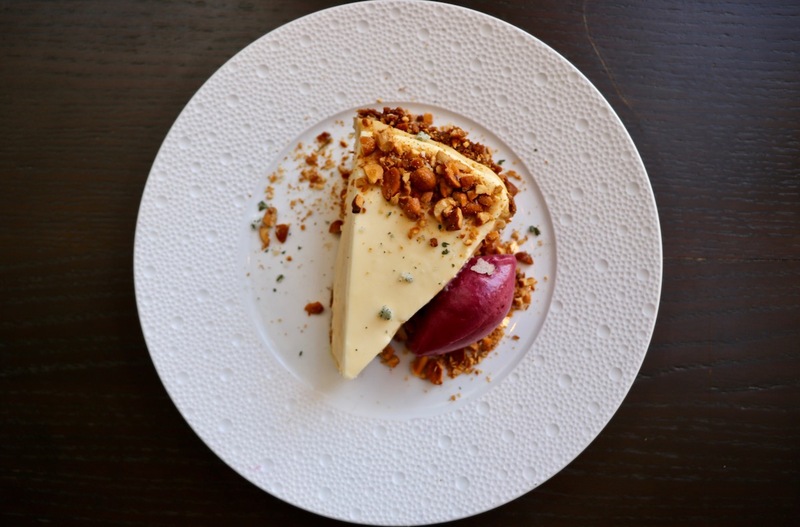 Smooth ‘n’ creamy peanut butter pie is complemented by candied peanuts and Concord grape sorbet. Make a reservation at Booth One. City Tap Penn Quarter, Washington, D.C. 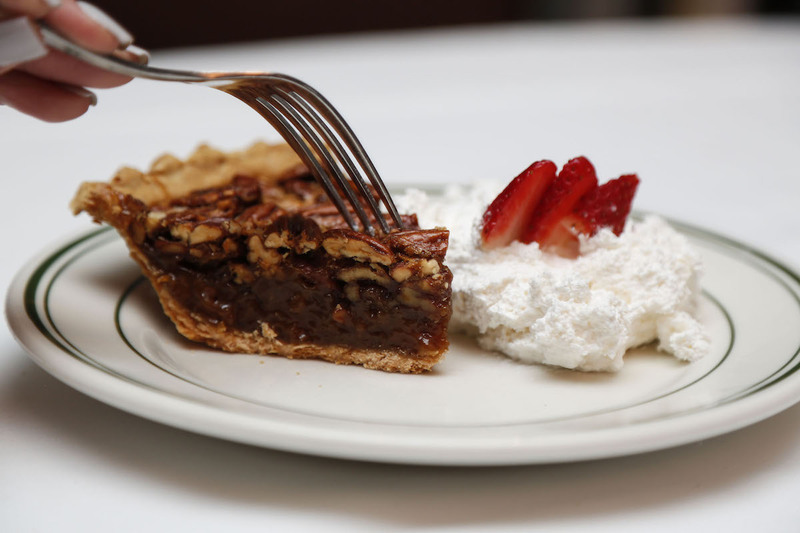 Warm and comforting, this Kentucky bourbon pecan pie is the perfect way to close out your meal. Caramel pecans infused with bourbon are the star of the sweet, which is lavished with caramel sauce. Maple bourbon ice cream is optional but highly recommended. Make a reservation at City Tap Penn Quarter. 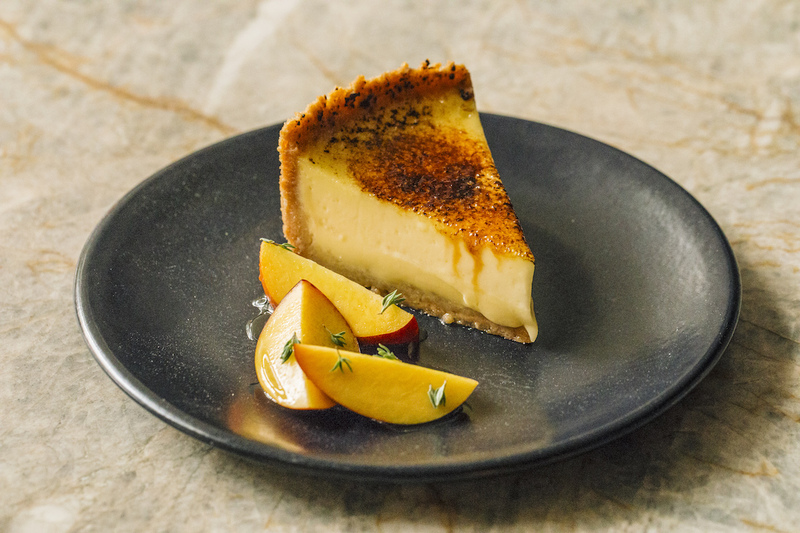 Creme brûlée, now in pie form. A generous section of the ultra creamy treat comes lavished with burnt honey. Apple slices on the side offer relief from the richness. Make a reservation at Aba. Where are you celebrating National Pie Day? Let us know in the comments or over on Facebook, Instagram, Pinterest, or Twitter. And, remember to snap + share your #dishpics with us on Instagram for a chance to win in our weekly giveaway. Photo credits: Leila Register (Little Goat); Sara Essex Bradley (Cooper Vine); Chelsea Francis (Clementine); City Tap (City Tap); Lettuce Entertain You (Aba, Booth One); Denny Culbert (Acre); Nevin Martell (America Eats); Stephen DeVries (Bow + Arrow).